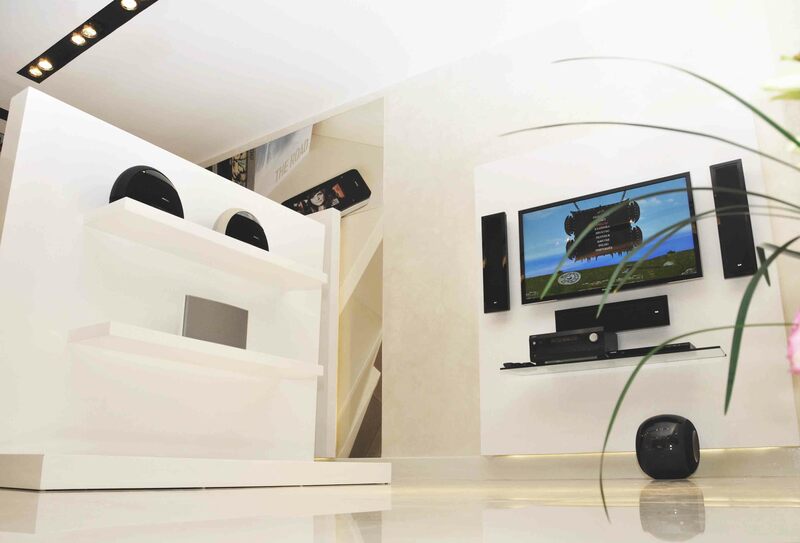 Based in the Middle East, a region that is always on the forefront of home technology, Archimedia sells and installs the most luxurious entertainment systems throughout the Middle East; Beyond home theatre and sound equipment, Archimedia’s strength lies in developing home automation systems that represent an easy, intelligent way to control lighting, curtains, security and temperature throughout the home. 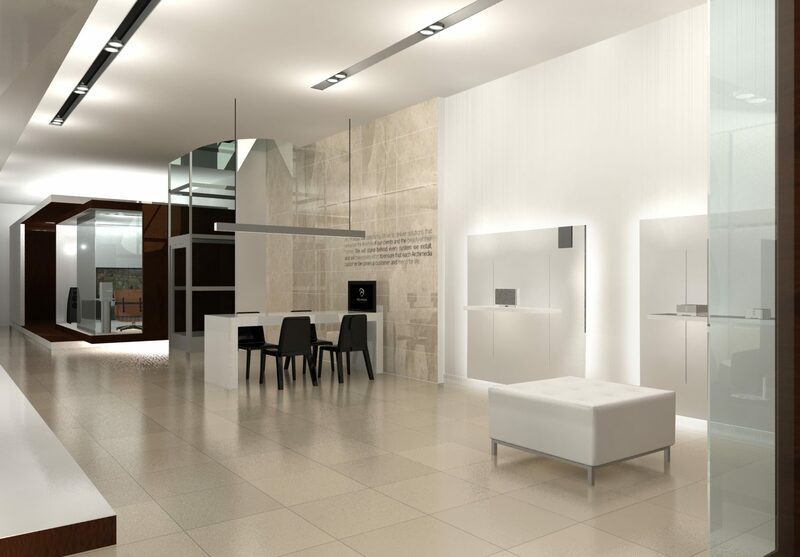 The design brief for the Riyadh showroom was to create an environment embracing an unparalleled level of luxury tailored to match the clientele – one of a luxury five-star hotel. 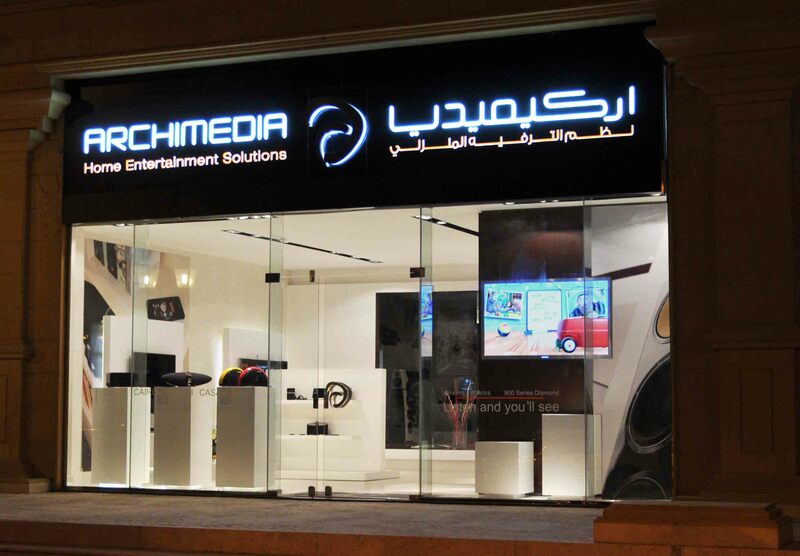 The flagship showroom in Riyadh would continue to incorporate the Archimedia corporate identity which highlights to the customer the seamless integration of the home living space with high-end technology – be it audio video, home lighting or security. No wires, no wasted space – complete functionality. 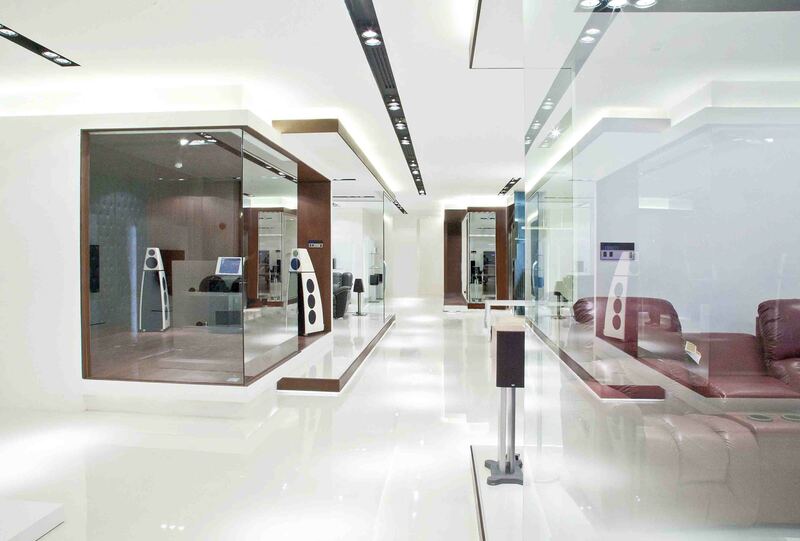 The ground floor of the Riyadh showroom facilitates five individual rooms that are architecturally connected; each individually branded, with a dedicated environment to showcase the hosted brand and its technology. 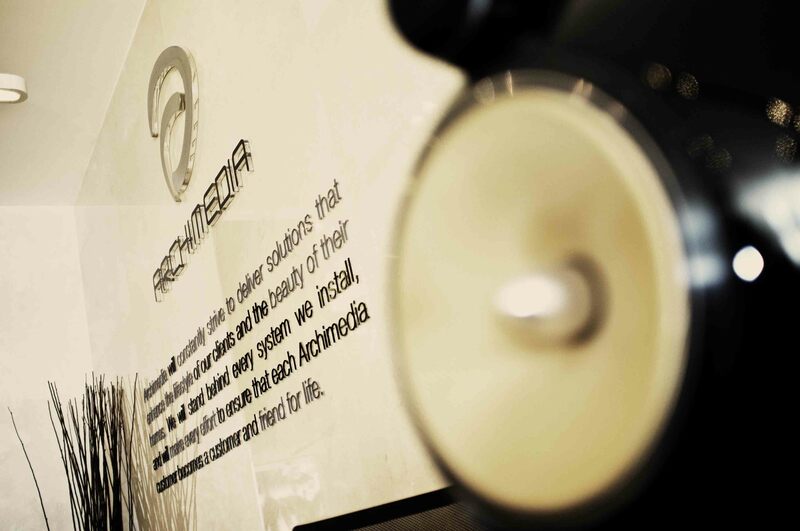 The atmosphere of each room is immediately softened by the use of luxurious padded walls, made of the finest materials such as suede and leather to create an unprecedented level of acoustic refinement and create a premium environment unlike any other audio-video showroom. Each room has specially selected furniture boasting a regional influence. The customer has the ability to manage the whole environment via remote control; from the dimming of the lights to adjusting the curtains and controlling the audio-visual experience. The floors connecting the rooms are made of high quality polished marble, which purposely reflects the chrome and white elements from the overhead lighting, which once again creates an exclusive look and feel. The first floor retains the premium feel as the customer enter a beautiful consultation area which is the heart of a number of rooms designed to replicate a luxurious apartment with luxurious living spaces, bedroom, bathroom, games room and lounge, helping the customer visualise how he could live with the technology on offer. 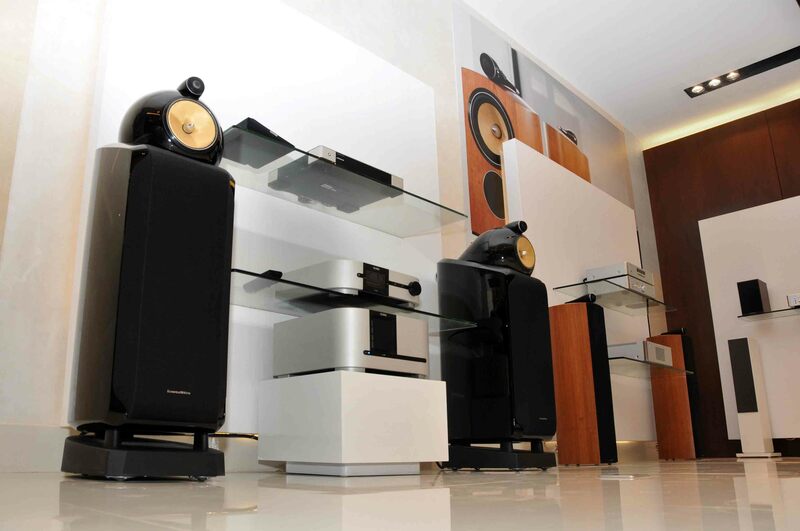 A dedicated theatre room incorporates the best quality of sound performance in the region. The seats have a control panel where all lighting, sound and ambience can be controlled via the touch of a button. The walls have hidden speakers, which gives the impression to the customer that the audio is coming from every part of the room. The bathroom has television screens behind the mirrors of the shower, which are activated as water hits the floor of the shower. The façade of the store has been created to present two different impressions during the daytime and at night. There is an eye-catching fifty-feet screen built into the front of the building, which changes its profile and style from day to night making it a key visual element.